Getting the best bass response from a subwoofer is one of the most important performance aspects of a good audio system. But it's also one of the most difficult to achieve. Bass that sounds boomy, bloated, over-resonant, and/or flabby can completely ruin the listening experience – it will matter little how good of speakers you have. On the other hand, tight, well-defined, and evenly distributed bass vastly enhances home audio, stereo, and home theater listening. It can be a little tricky to have a single subwoofer cover spacious and/or adjoining rooms evenly with sound. However, by adding a few more subwoofers into the mix, you can influence the quality and output of your audio system. Bass quality is mostly determined by two factors: subwoofer placement and listener position. In a typical home listening room, bass frequencies can sound over-bearing in some locations yet very lean in others. It all depends on where the subwoofer is placed and where you sit to enjoy the audio. The reason for this is room resonances. Room resonances are areas where some of the subwoofer's sound waves (i.e. standing waves) build up to make the bass louder than it should be (peaks). Room resonances also create areas where some of the waves cancel each other to make the bass sound weak (dips). Experimenting – it can feel a lot like trial and error – with subwoofer placement for best performance is how you can find the location(s) that help to eliminate (or at least minimize) a lot of the peaks and dips. Smooth bass is what you want. There is a third factor that can greatly influence bass quality: the number of subwoofers. While one subwoofer may produce enough bass for an average sized room, buying additional subwoofers can reduce the occurrence of room resonances and improve the overall quality of bass throughout the room. The key thing to understand is that it's not about adding more bass; it's about improving bass quality and distributing it more evenly throughout areas. Two, three, or even four properly positioned subwoofers can effectively cancel some (if not most or all) room resonances. Not only can the overall bass performance improve, but it can improve for multiple listening positions instead of just one. 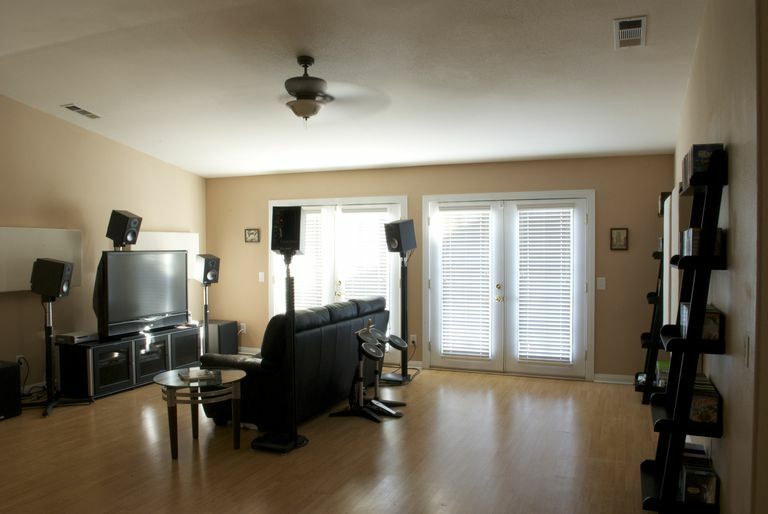 Think of multiple subwoofers like central air that can affect all areas of the home, whereas a single subwoofer is like a standing floor fan with limited reach. Many typical set-ups utilize two subwoofers positioned in opposite corners of the room. This is an easy way to gain significant improvement and cover more space. There are also subwoofer systems that include four separate subwoofers powered by one single amplifier – better bass reproduction practically improves just about everywhere in the room. While four subwoofers may seem like overkill to some, having a pair is manageable and will provide much better bass than a single subwoofer alone. Subwoofers are available in a wide range of prices from a few hundred to many thousands of dollars. Be sure to understand the difference between passive and powered subwoofers (you'll want to make sure your system can handle it all). The improvement in bass response with multiple subwoofers is so apparent that many advocate purchasing multiple lower-cost and/or smaller subs over a single expensive and/or larger one. The performance of four generally beats out two, but two is always better than one.